Miele tumble dryers feature cutting-edge drying technology and provide some of the best tumble dryer energy ratings available. Offering eco-conscious heat pump, vented and condenser dryers to suit your needs, Miele offers a two-year guarantee on all of its dryers for added peace of mind. The Miele tumble dryer range features three dryer styles. Vented tumble dryers dry laundry in a short time and the moist air is removed via ducting to the outside. Condenser dryers enable flexibility of installation because only a power socket is required for connection. There is no need for outside venting as moist air is cooled down in a closed air circuit, condensing the moisture. Heat-pump tumble dryers offer the same convenience and flexibility as a conventional condenser dryer but are more economical as they use up to 50% less electricity. Miele tumble dryers feature a range of clever innovations unique to the brand. Miele EcoDry technology guarantees long-term low energy consumption and short drying times. With EcoDry, Miele heat-pump dryers constantly work economically and lint cannot clog up the condenser unit, which could otherwise cause blockages and reduce power output over time. All Miele tumble dryers use sensor drying to guarantee perfect drying results. Using a residual moisture detector, any remaining moisture in each load is detected and the cycle is fine-tuned appropriately to avoid damage caused by over-drying. All dryers are also with drum lighting, many with maintenance-free LED lighting, to illuminate the drum so that you never overlook any laundry items. With delay start and a countdown indicator, you can rely on well-planned laundry care. Delay start allows you to determine when you want the next drying programme to start. This means you can make better use of night-time electricity tariffs or time your programmes to end when you need them to. The display always indicates when the current programme will finish. 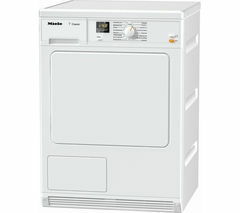 Economical and environmentally friendly Miele heat pump tumble dryers achieve an A++ energy efficiency rating with ease. Intelligent drum reversal changes the direction of the drum rotation at irregular intervals to prevent laundry tangling up and reduce creasing. 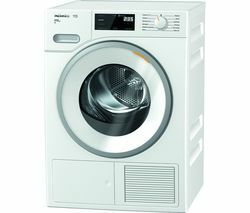 For more clever tumble drying solutions take a look at our Bosch tumble dryers and check out our Indesit tumble dryers.